“Last Bitc0in Supper” by Youl. As part of today’s global cultural zeitgeist, it’s hardly surprising that bitcoin and the ideas behind it has become a hot topic in the art world. Cryptocurrency has inspired entire gallery shows, as well as some poignant individual works by artists from around the world. One of those works, “Last Bitc0in Supper” by the French artist Youl, sold for a very respectable $2,900 (4.7 BTC) over the weekend on eBay. Although it’s not entirely clear if this is the most paid for a work of bitcoin art, the hotly contested bidding does indicate that there is growing demand for cryptocurrency themed work. Part of the appeal of the piece is the quality of the work itself. 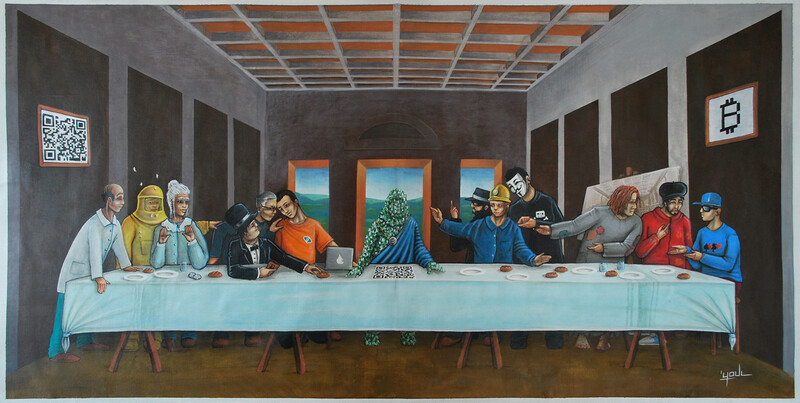 The painting 140cm by 70cm painting is an homage to Da Vinci’s “The Last Supper,” with Jesus replaced by “Jesus manifested as the blockchain.” Surrounded by a range of apostles, each easily recognized as a character from bitcoin’s story thus far (a miner, a techno-anarchist, an online gambler, a scientist), a shady-looking banker takes the place of Judas Iscariot. As Cryptocoins News suggests: “Judas’ act is being witnessed by the scientist at the far left and the grandmother, who seems shocked, perhaps because she just found out that the wallet is empty. For the Bitcoin Judas is none other than Mark Karpeles and MT Gox …” In “betraying” bitcoin, Youl may be suggesting, Mt.Gox may have set in motion a much greater series of events to come. Like all art, the value of “Last Bitc0in Supper” is completely subjective. The piece’s seller, the Santa Monica, CA,-based Project Bitcoin, originally commissioned it from Youl for a price of one BTC (around $1,000 at the time), meaning the value of the painting has grown significantly over the original price. Bidding ended on the piece yesterday, having exploded from a mere $1,000 bid on Saturday. In total, 58 bids were placed on the work. Under the terms of sale, fittingly, the winning bid must be paid in bitcoin.